I came down with a terrible flu last week. So terrible that I didn’t even have much appetite (that rarely happens to me), and couldn’t think of what to have for dinner. Fortunately my appetite came back after a couple of days, which I figured as a sign of recovery, and one of the first things I wanted to eat was pasta. In fact, I could eat pasta pretty much everyday, not a problem for me at all. I often make pasta for lunch or even for breakfast 🙂 at home. And since Hong Kong is pretty much summer 9 months a year, most pasta dishes I cook are quick, simple and light but packed full of flavors. 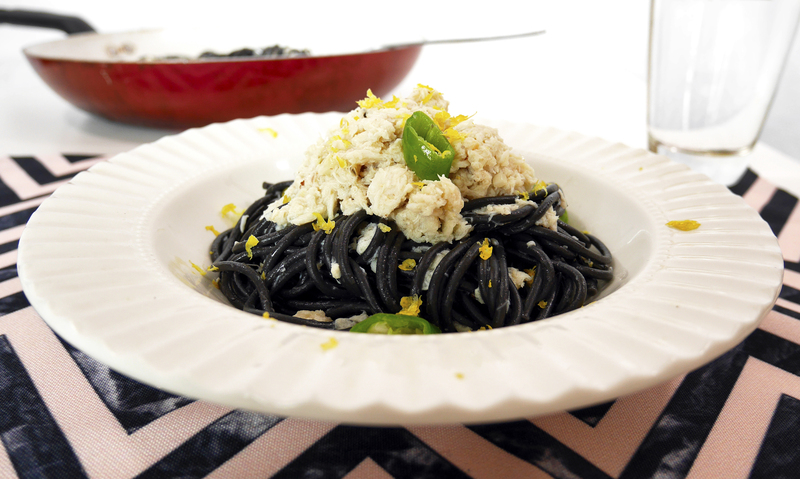 This squid ink spaghetti with crab and green chilis is one of them. 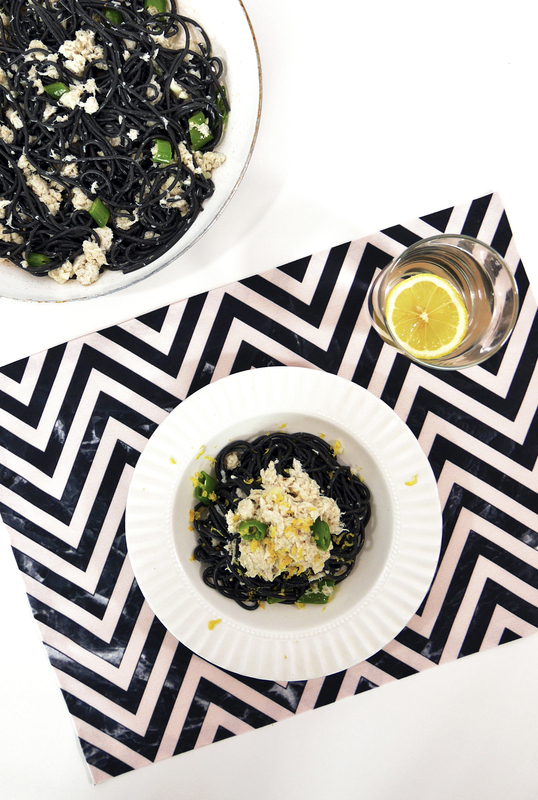 I love how the freshness of green chilis complement the robust flavor of crabmeat, and how well they both marry with al dente squid ink spaghetti. And most of all, I love how quick and easy it is to make. If you have 20-25 minutes, which is shorter than ordering and waiting for most takeouts, try this recipe. You will be pleasantly surprised. Start by boiling water in a large pot with a plenty of salt. And have all listed ingredients ready by your side. Crush garlic with a flat side of your knife, this will make it much easier to remove the skin. Remove/peel the skin, chop them finely and set aside. Chop green chilis into 1/2 inch length and set aside. The water should be boiling by now, add the spaghetti, cook for 7-8 minutes, or follow the instruction on the package (if any) for al dente bite. While the pasta is cooking, gently heat olive oil in a pan, add chopped garlic and chilis. Stay over low heat, stir and cook for a couple of minutes without browning the garlic. Add a few pinches of salt and pepper to season, then stir in crabmeat and white wine. Bring the heat up to medium, simmer for a couple of minutes or until the liquid is reduced by half. Remove the pan from the heat. Take some of the crabmeat and set aside for final plating later. Pasta should be cooked by now. Turn off the heat, directly transfer from the pot into the pan. I do it this way so I won’t have to carry a heavy pot to drain the pasta, and also to add some of the starchy liquid that is still in the spaghetti. (Not to mention having one less stuff to wash up). Mix them well in a pan, taste first then season. Crabmeat can be naturally salty, so I always taste before adding more salt. 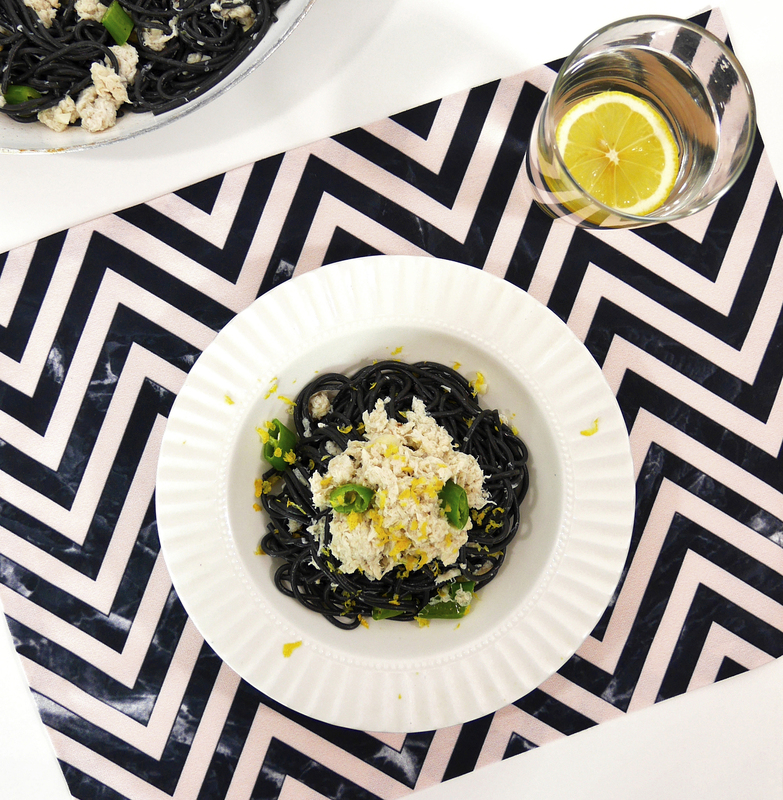 Plate the pasta, top it up with crabmeat you set aside earlier, and add the zest of fresh lemon. A drizzle of extra virgin olive oil won’t hurt if you have some. Finally, add a good squeeze of lemon. Please do not skip this part, it makes a world of difference. Delicious recipe, Jin! I was just wondering where you’d gone because I haven’t seen your posts in a long while and then I discovered you’re still posting your lovely recipes, but somehow I wasn’t following you anymore..How odd! Must be some kind of wordpress glitch or something. Hi Eli. I in fact took a really long break 🙂 just got bk on blogging last week. So sweet of you to think of me ;-). Your blog looks so much more beautiful and professional than before! Thanks for stopping by, it’s great to reconnect. Xoxo.